First off, I want to apologize for not running the pics last Wednesday. I spent the morning in between storms trying to get the house presentable before my husband got in. When he's gone for three weeks at a time, I always spend the days he's on the road driving to and from Chicago occupying my mind with house work. I totally spaced even turning on the computer. I do have those pictures and weather permitting, they will post on Wed. We've been dealing with lots of storms and lots of rain, having acquired 12 inches of water since Thursday evening. Storms have also meant very little internet time. I'm squeaking this post in between storms. For my Magazine Monday challenge this week I pulled a copy of Stamp It Cards 2005. However, I did not select a card from one of the projects. 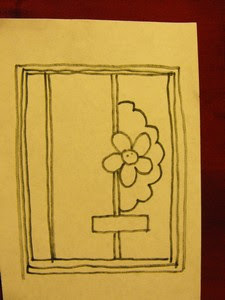 Instead, I took my inspiration from a card in a Stampin Up ad. I just liked the card and new it would be perfect. I needed Mother's Day cards for the Little Rock Arkansas Ronald McDonald House. The card in the ad used an image of a cake and a frame from FRAMES & GREETINGS (Su 2005) I chose to use a variety of stamps Many Thanks, Dear Friend, Days Gone By, Studio G and Hampton Art. I did eight cards in Almost Amethyst and eight in Pretty in Pink for a total of 16 cards. I watercolored the images. The inspiration card included eyelets on the four corners of the very vanilla mat. The mat was also background stamped with a scroll image and then LOVE from another SU set stamped in black near the top. Sage organza ribbon went across the bottom of the card about 1.5 inches up from the bottom. I didn't have a ribbon I liked to match either of my CS colors and try to reserve my metal embellishments for cards I know are going to be kept. My take on this card was just to do it simple yet perfect for a child to give to their Mom. Yep, I'm finally getting in here with a TeaPot Tuesday Challenge post. I'm not sure if I'll get to post the actual picture of my card today. Depends on whether I can get it done to upload before storms take over my day. They say we're in for severe weather. I'm hoping it holds off til this afternoon. So I'm posting a picture of one using the same stamp I'll be using for this challenge. e exhausted her personal collection of 100 tea pots and now searches on-line for teapots to share with us. When we're not using tea pots for our inspiration, we are directed to make/ share a card with someone who could use some cheering up. A Random Act of Kindness (RAK), if you will. I don't know the name of the stamp company. I bought the stamp from a LSS going out of business. I like to stamp the image as is, then stamp another image to cut apart and paper piece in to give the dimensional effect of stepping out of my garden shed and into my garden. May my garden truly look like this someday. I hope Kay enjoys it. Tomorrow, I'll finally be posting pics of my new kitchen curtains for Needlework Wednesday. We all know how crazy March was for me. Needless to say, the March Christmas Card Challenge at SplitcoastStampers wasn’t met on time. So I decided this week I’d find something quick and easy while pairing it with Magazine Monday. I didn’t realize I was going to find something THIS easy. I pulled out the Winter 2005 issue of Paper Made Easy. I only have 3 or 4 of these magazines but really enjoy the projects they include. 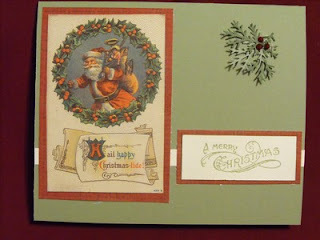 ut used a Vintage Christmas Collage Paper from Paper Love Designs. She matted them simply, added a sentiment and called them done. With the exception of one card, her only embellishments were brads to adhere the sentiment mats. d past the holidays, the only embellishment I added was Christmas Red Stickles (a gift from my Secret Sister back in February). I made the 11 base cards from Mello Moss cardstock (Retired SU). I used Always Artichoke to accent the Mello Moss for the pine bough punch outs and stamped the sentiment in Mello Moss ink (Retired SU). The sentiment is from SU – Bells & Boughs set. I stamped the greeting on Very Vanilla and matted on the inside. Now to think about April's Christmas Card Challenge. I'm sorry I didn't get this posted yesterday. I spent the entire day in a funk. I thought it was because I'd gone back to bed at 5 a.m. and not gotten back up til 10. Going back to bed in the mornings will give me that 'drugged' feeling so I try not to do it. I found out later, it was probably had more to do with a soul visit from a dear friend. A couple months ago I posted an eagle 'get well' card that I'd made for my friend, Wally Bailey. I've known Wally, his wife Sonja and their families (both immediate and extended) for over 20 years. Yesterday we all had to say goodbye to the husband, father, grandfather, our friend. It's a difficult time and my heart aches for them. The only thing I know to do from this distance is to offer up prayers of healing and to pour my feelings into my art. We had been told on Friday it was about making Wally comfortable. So the first card I made yesterday morning was a sympathy card I knew I'd need. I just didn't realize how soon. 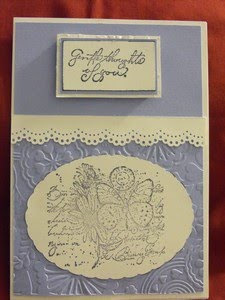 The card was inspired by the March Card Kit Swap Soni and I both belong to on Splitcoaststampers. The Kit Hostess for March 2011 was Dody and she sent a great envelope of things to play with. I came up with 7 cards mixing and matching Dody's items with my own images and paper scraps. The design idea came from the April 2003 issue of Crafts n Things Magazine and artist Melanie Douthit. She is a talented freelance artist who morphed into using scrapbook supplies in her art. I hope you'll take a few moments to click on her name - linked to her blog. And here's what I came up with from Dody's kit. This is the only card of the seven I didn't add anything to except Wild Wasabi card stock to accent the yellow and the scalloped circle Dody included. I'm going to miss Wally. All of us who knew him, will. But it seems appropriate the items to make this card came from within Soni's circle of card artists to send her comfort and love. Okay.. Awards may seem vain, and maybe they are. But if an award comes with comments that help define WHY the award was given, then it's a big help in determining our strengths and weaknesses. I like to know these things as they help me understand what a magazine editor might also be seeing in my work when I submit. 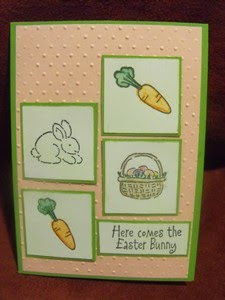 I received notice from Heather at SplitcoastStampers the bunny card front I'd made for the Easter Ronald McDonald House Swap was chosen as the Overall Nicest Card. Cool, huh? Remember, this is the card I designed during VSN last month with the layout representing the chambers of the heart. Detail wise, the embossing folder background is really nice as it breaks up the pink space … . The images are cute and well proportioned, it has great use of negative space … they are just well laid out and not busy or crammed but at the same time do not look like they're missing anything. It's just a real nice clean look to it. When I look at it I see "elegant" rather than "kid card". Please take time to check out Heather’s Gallery at Splitcoast. She does lovely work in a variety of mediums. It felt really good to get back into the Studio this morning and work on a project. It didn’t take long to clear the desk and pull open a magazine I’d been looking at last week. Isn’t it funny how you start with something and wind up totally different from where you began? For this week I went to the October 2009 issue of Scrap and Stamp magazine. They did a 2-page feature of former Our Daily Bread Designs designer, Kelley Holland. First off, her work is BEAUTIFUL! Layers, texture, well-coordinated colors. Kelley blends everything into a work of art. If you’d like to see an example of Kelley’s work, you can check out her GALLERY at Our Daily Bread Designs. By the pictures in the magazine spread, it looked as if all of her samples were square cards. I don’t work with square cards mostly because I don’t want to have to buy/ make square envelopes. So I went with the traditional rectangle. A monochormatic card in browns and caramels first caught my eye. There were 4 layered tiles in the corner positions with a larger centered tile for the focal image. I thought cool! I’ll do it in caramels and red and use a Pooh bear image for the Ronald McDonald house RAK. I pulled my Pooh Bear image and got ready to pull cardstock. Oh wait! (my mind has caught a delicate one on the other page) This one is really pretty. Elegant and simple. Base white, matted pink and then a matted white that had been run through the CB dotted swiss and edged with the MS Lace punch. Kelley then used a scalloped oval in the Spellbinder in pink to mat a slightly smaller duplicate in white. She stamped a sentiment on the white oval and added a shaded pink grograin ribbon about 1.5” down from the top of the card. The hinge of the card was at the top. Although she used a religious sentiment I thought it would make a perfect baby card. But while pulling images, I had yet another epiphany. 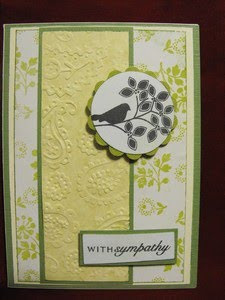 One of the gals in our S2S thread at Splitcoaststampers put out a challenge earlier in the year to make a batch of Sympathy cards. With that in my head, I was off. I used Very Vanilla and Almost Amethyst (retired SU) CS from Stampin’ Up . 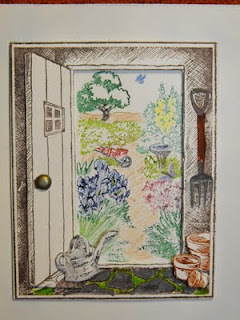 For my image, I selected Garden Collage (retired SU). Everything was edged and stamped in Vintage Violet. Because the card front was larger than the CB folder, I only embossed the bottom 4” and left the remainder plain. Since I used the MS lace punch, I decided against ribbon. I thought about the ribbon, but I liked the scalloped edge of the MS punch playing off the scallop of the mat. What do you think? Not where I started, but I like how it evolved into something that might bring comfort to someone when they need it. Well as you can see, nothing posted the whole time my granddaughter was here. I wound up with a head cold and didn't do much of anything the whole time she was here except watch Bambi, Cars or Nemo over and over and over and ... well, you get the idea. Lots of snuggling. Lots of napping when Grandpa could take her out to blow bubbles and hike in the woods. She loves to take timber walks. She left on Sunday and hubby left on Tuesday. I feel better but I spent Tuesday, Wednesday and part of Thursday finishing up 2 swaps. One was a 6x6 Tea Time Recipe swap. I created recipe cards for 2 categories - Vegie salad on toast points and mini Eclairs. Wouldn't you know it, I put both in the mail without taking any pictures. So I'll have to post those when the swap comes back in a couple weeks. I'm only signed up for 1 more swap between now and June. I don't plan on playing in any others. I have plenty of other projects I want to work on - not 'have to get done' things.